Following our successful preparation of a Preliminary Engineering Report two years ago, Northwest Seaport has asked OTM Inc to submit a bid to serve as project manager for the Lightship Rehabilitation. We assembled our project management team and had our first meeting at the Northlake Pizza Tavern to discuss how to effectively perform the duties outlined by the Seaport. The meeting went well (and it was $2/pitcher PBR night!) and we’ll have the bid in early next week. Brian, the Ocean Bay Marine Inc shipwright and OTM Inc shop partner, has been working with the Seaport on assorted projects since 2007, and he’s really interested in doing public classes like Diesel Engine Theory, only with wood stuff rather than engines. I met with him this week to talk about I got the engine programs up and running. Trouble is, it takes a lot of time and effort to develop programs like this. I told him to be patient and persistent, and offered to talk more any time. I hope he gets something going – the Arthur is a great boat for people to learn on. The Shop is now plugged with Washington parts from the Arthur Foss. After last week’s exciting Session One of the 2009 Diesel Engine Theory Workshop, I loaded all the parts we took off Cylinder Four into my truck and brought them to Ballard to be cleaned, tested, painted, oiled, lapped, and set as needed. This includes the fuel injector, the intake and exhaust valves and valve cages, about half the intake manifold, some couplings from the exhaust manifold, the rockers and rocker arms, the push rods, and pieces of the water cooling system. Pretty much all of my work space is covered with Arthur parts, but it’s great. We spent most of the week getting all these parts stripped down and ready for the class to work on. Crystal, OTM’s mechanic, worked with me to clean engine parts, and she also serviced the Arthur‘s generator. I also hired on Sterling the future towboat captain to get ahead a little, since I’ll be heading out to Qunicy again next week. We also spent a lot of time getting the cylinder head off. Following last week’s class, one of the head nuts just would not come off. We tried oil, fast heat, slow heat, paraffin, and hammers, but it wouldn’t budge – it destroyed two of the output drives for our big torque multiplier (don’t worry Brian, we ordered new ones). Then I talked with Dan, who said to get a slugging wrench from Pacific Industrial Supply (they’re in South Park now). I went and got the wrench and we strapped a comealong to it real tight, then wailed on the wrench with a really big hammer. It finally did the trick – the head nut came loose in about three blows. Even with all the head nuts off and a serious strain on the lifting straps, the head was not going anywhere. The engine is more than eighty years old and all the minor leaks and corrosion over that time had caused the head to become one with the cylinder and studs. Crystal and I had to use sawzall blades to cut through all the corrosion in the seam, then we hammered dozens of little wedges in to pry it loose. After a lot of hammering, it finally came off with a little tiny “pop,” and we winched it up. The Arthur has the biggest size of cylinder that Washington Iron Works ever produced. Its cylinders have an 18-inch bore and are really, really big. We estimate the heads as weighing about 2,200 pounds. As we lifted the head off cylinder four, I pictured it as a wrecking ball until we had it secured it to the deck. Early Saturday, the Diesel Engine Theory class all met at the Shop. We spent the morning cleaning parts using wire wheels, sandblasters, hot lye, needle guns, flapper wheels, belt sanders, hammers and chisels, acid baths, solvent, 409, rags, and fingernails. 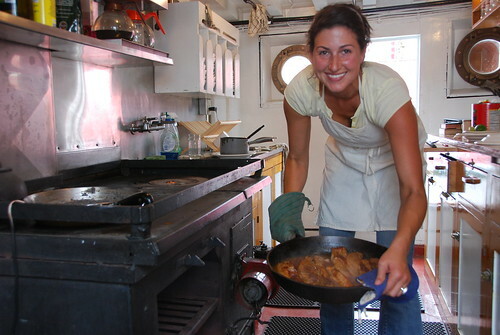 At lunch time, we all headed down to the Arthur for hamburgers and salad prepared by chef Kim in the sizzling-hot galley. We spent the afternoon cleaning the bigger pieces still on the boat. We cleaned the piston with scrapers and flapper wheels, then cleaned out the piston ring grooves using a broken ring with a handle duct-taped to the other end. This gave us a tool exactly the right size and shape to scrape out all the gunk clogging up the ring grooves, and there were plenty to go around. We also cleaned the threads on the studs that protrude from the cylinder. I decided that the best way to do this was to run the nut up and down the stud using lots of valve-lapping compound. This gritty mixture machines off the rust and dirt and makes sure to keep the threads the right shape. The downside to this process is that it’s painfully slow, but the students all did a great job – especially the TAP guys. We also pulled out the rod bearing. The babbitt is cracked up, but not too bad considering that it’s been at least 40 years since it was last re-poured (and probably a lot longer than that). We’re not going to have it re-done this time; a full chapter in one of my diesel repair books is dedicated to running on cracked bearings. It says that as long as there aren’t any holes in the babbitt larger than a dime, you should be okay. The number four rod bearing babbitt is mostly just cracked, with only one little hole that’s way smaller than a dime, so I’ve decided that it’s okay for now – especially since we run the engine so lightly these days We’ll plan on re-doing the rod bearings after we service all six cylinders. Last and most tiring, we used the ball hone to clean up the liner. It was agony because our ball hone is 16″ and the Arthur‘s cylinders are 18″, so we had to swirl it around to get the liner cleaned and patterned correctly. OTM Inc spent most of this week scraping and fitting rod bearings for the Indian Grave Drainage Pumphouse‘s Fairbanks-Morse diesels, and making some fine adjustments to the main bearings. I did this with much relief, after getting satisfactory results when testing the main bearings. Old Tacoma Marine Inc’s intrepid investigative reporter Jacoba took a field trip to see the Atlas boat MV Tuhoe in Kaiapoi, New Zealand. This neat old boat (the only Atlas boat we know of in the Southern Hemisphere) is an old cargo auxiliary schooner, powered by twin 6EM327 Atlas-Imperial diesel engines. The twin Atlas-Imperial engines of the M.V. Tuhoe rattle in well-tuned percussion as John Thompson, one of the ship’s chief engineers, eases on the throttle. The engine room is tidy, and the fixtures are color-coded with bright, glossy layers of paint to help newly-trained volunteers. Arthur Foss Cylinder Four Overhaul begins! 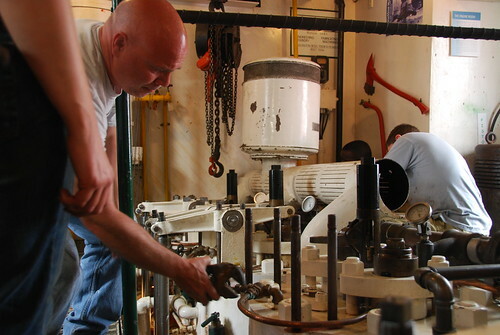 I flew back to Seattle on Thursday night, just in time for the Diesel Engine Theory workshop on the Arthur Foss. OTM Inc runs this in partnership with Northwest Seaport and the Center for Wooden Boats at South Lake Union. We’ve been planning this session – overhauling cylinder four – for years, and getting ready for the class was stressful since I was in Illinois most of the month. I really wanted everything to go well despite only preparing over the phone, but I shouldn’t have worried too much. The first session went very well. We had eight participants (a full boat! 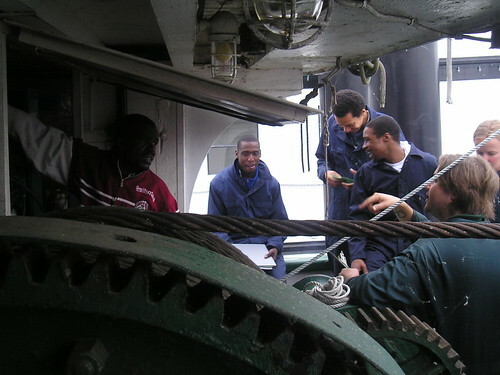 ), including four guys from The Anchor Program (known as TAP) who’ve been doing a bunch of work on the Arthur. After coffee and introductions, we took a tour of the boat, oiled and greased everything, and ran the engine and both generators for a while. I got a lot of good questions and everyone was really interested in the boat and the engine and diesel engines in general. After lunch, Dan gave his Diesel Engine Theory lecture, which was even better than last time. He brought along a lot of parts to illustrate his points, along with dire warnings to not damage the injector tips! After the lecture, it was time for the big moment: taking the engine apart and fixing it. I’d gone and gotten a lot of tools while preparing for the class, so I divided the students into two groups. I set one group to taking all the jewelry off the head, and the other group to taking the access panels off the bottom of the engine and getting ready to take the rod off the crankshaft. Now, I bet a bunch of you reading this are thinking “holy cow, he just let a bunch of students start taking stuff apart and he wasn’t watching them like a vulture watches a dying horse?” Well, heavy-duties like the Arthur‘s Washington come all apart pretty easily with socket wrenches and screwdrivers, but there’s a lot of hardware that has to be taken off. All the students were really doing was turning wrenches, but if you’ve never taken apart an engine before, you learn tons from just turning the wrench and seeing how it’s all put together. By the end of the day, we had cylinder four nearly all stripped down. We got stuck on one head nut just as five o’ clock rolled around, so we left it like that for the night. I’ll have a lot more to report about the class next week, so stay tuned! This week, OTM Inc is still in Illinois, fitting bearings. Last week, three of us started scraping the re-babbitted bearings into the Fairbanks-Morse diesels in Illinois. We got everything set up and started barring the engine over so that the lapping compound could do its trick, but it was really painful. The bearings don’t fit very well yet, so it’s really hard to turn the engine over and we were dying. Keith went home on Friday vowing to invent a turning tool that would make it easier. I took pictures of the one I saw in Oblong and sent it to him, but he apparently came up with a couple different designs over the weekend. He brought one in on Monday and spent all morning adjusting it. I didn’t pay close attention, since I was still working on the bearings, but finally I heard the “clang, clang, clang” of the the pawls riding on the flywheel as it turns. Sweet! The three of us got into a good rhythm: Keith and Nathan would set in the bearings on Engine Two, then lap them while I scraped bearings for Engine Three. Then, we would switch, so that Keith and Nathan were setting in the bearings that I’d just scraped. We we cruised through alota bearings, but we’ve got a lot of fitting to do before we’re done. Over the weekend, I went down to St. Louis to pick up the next set of bearings. This time, I stopped at Keith’s house in Carlinville to drop off the outer “race,” or rod bushing. 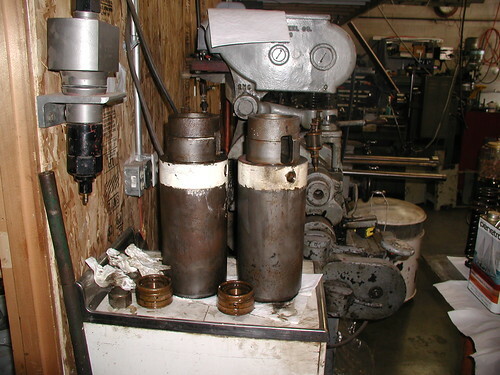 Unlike other heavy duties I work on, Fairbanks-Morse diesels use needle bearings between the piston and the piston pin. Lamar ordered new outer races made for Engine Three, which Keith will be installing at his shop. Then on Sunday, I visited the Le Sueur Pioneer Power Show grounds, where there’s a (4) 32E12 that drives a generator. Their building was closed, though, so I had to look through the window. Lame. They’ve got some small pictures of it posted on their website here, though. Anyway, these things are everywhere out here! I love seeing all these great old diesels. We’re trying to get them all up on the website so you can see them, too. I’ll be in Illinois for a while longer, so if anyone reading knows of another heavy-duty to see, let me know. This week at OTM Inc, I fit in all the rod bearings on the Catalyst. I blued each shaft and placed the bearing half on the shaft, moved it back and forth, then pulled it off and inspected the contact area. If it wasn’t fully connecting, I shaped it to fit better. All of the bearings in this set were just a little long. I took off material on the ends with a rasp, then used rounded files to reshape the radius. Each one took a few tries, but number six was a little more difficult. Once all the bearings connected with the crank with a little fore and aft room, I lapped them in a just a bit. This probably wasn’t necessary, but I did get a much more defined contact pattern by using a little Timesaver. To save time, I didn’t fit the spare bearings. That will need to be done before they’re put in, if they’re ever needed. I also assembled the pistons at the shop. I refit all the wrist pins to a close two-thousandths of an inch. Some felt tighter than that, so I also ran them through with lapping compound for a bit. Then I placed them in the cradle and used “Doctor Squash,” our hydraulic press, to press in the pin. I missed the alignment by a little bit on one of them and had to redo it. Once I got all the pistons out the door, I was able to see the shop floor again. I gave it a thorough cleaning while I had the chance. As you of course know, Old Tacoma Marine Inc just passed the one-year blogging anniversary. We’re very pleased by how many readers follow us, and are very happy that the story of the old diesel engine field is getting told. However, we did a lot in the years before 2008. OTM Inc has been around for a long time – we incorporated January 1st, 2000, and have been working hard since. To get some of those older stories out there, we posted all of the weekly reviews for the last eight years prior to 2008. Of course, we haven’t actually put content in them yet, but we’ll fill in the company’s history and link you to it once it’s up. Stay tuned! That’s the strain gauge stuck between the throws of the crankshaft, which shows how much the crankshaft is flexing, which in turn tells me how high the main bearings are and which are holding up the crankshaft. One at a time, I rolled each main bearing out, did a strain gauge on the bearings to either side of it, then rolled it back in and went on to the next. I was looking for changes made by its absence, like whether it had been lifting the crankshaft more than the other bearings. Lapping really doesn’t take much material off, since barring the engine over is so slow, so I did some scraping, too. They took a while to do, since I had to do so much barring, but I eventually got them to the specs outlined within the Washington manual. I heard recently that the cooling system for the Westward‘s thrust bearing has been disabled. I understand the reasoning: thrust bearings typically have a water jacket to cool them, but it’s a small casting that’s easy to damage. I’ve seen them cracked up from rusting, freezing, and for no reason that I could see. My guess is that the Westward‘s thrust bearing started leaking and the owners got concerned and decided not to run coolant through it any more. I hear that they’re monitoring it’s temperature closely while cruising to make sure that it doesn’t overheat, so it’s probably fine. Heck, it just made it around the ocean that way, so it’s definitely fine. Just don’t try this at home: the Westward folks are experts and know their boat really well. Unless you are that good, don’t disable your thrust bearing’s cooling system! Information about a little Atlas-Imperial? Neat, but I don’t know anything about this kind of engine. Readers, can anyone provide information about the little ones like this? What a great old engine. I can’t wait to get out there to see it myself. Until then, I’ll just have to look through all the shots here. They’re so beautiful – all clean and shiny and brand new. There’s several other views here. OTM Inc officially hired a new employee this week: Diana the museologist! Her services have been available by contract for the last year, but now she’s officially part of the Old Tacoma Marine Inc team. She’s taking on some of the curatorial components of Old Tacoma Marine Inc’s business. Now that winter is here, Old Tacoma Marine Inc reminds you to winterize your engine room! Use anti-freeze in your cooling system, turn on a heater in the engine room, and make sure to run the engines occasionally, even if you don’t leave the dock. These are very important precautions to keep your boat and its old engine safe during the winter. Just last week, one of our favorite boats severely cracked some large castings in the Pacific Northwest’s cold snap and blizzards. We are very sad to hear about the damage and feel that we need to get out the word that the brittle cast iron easily cracks if the coolant freezes. Drain and pickle if the engine will be left for long periods of time, but using antifreeze, a block heater, and occasionally running the engine is the most effective to prevent freezing and cracking. This week, I’ve continued work on fitting the main bearings into the engine. During the initial fitting, I used bluing and scrapers to get them to about the right shape; now I’m using lapping compound, which is a very fine grit, to get the perfect. This shows me exactly where the bearings and the journals actually touch so that I can scrape down any places that aren’t quite right. Once the squisher tool is installed, I put the bearing in, put the lapping compound into the bearing, crank the engine around, take the bearing out, clean off the lapping compound, and look at the pattern of scratches that lapping compound left on the babbitt. If the scratches are in just a few areas, that shows me where to start scraping to get it to the right fit so that I can test it again. If there’s scratches all over the bearing, I know it’s getting good contact and is ready to go. Once I know the bearing is getting good contact with the crankshaft, I need to test how high it is – how far up it’s pushing the crankshaft. If one bearing is holding the crankshaft up higher than the others, then the crankshaft will bend. This shows up when I do a strain test to determine how far apart the throws are. If the strain test shows that the bearing is too high, I roll it out, scrape it down, re-fit it with lapping compound to make sure that the contact is still good, and do the strain test again. Continually rolling the engine over by hand to test the bearings like this is a work out. I only have three main bearings to test, but it takes a long time to get them just right. At least as I go, the bearings start to fit better and barring the engine over gets easier. It’d sure be nice to get it back for the boat. We’ll be spending the night of the 31st on the Skillful to watch the fireworks on the Space Needle. I hope that everyone reading has similarly fun plans! This week at Old Tacoma Marine Inc, I spent most of my time on the Catalyst, continuing this year’s big winter maintenance project. I did a lot of cleaning this week, mostly on the cylinder heads and pistons. Washington engines like Catalyst‘s have a lot of very elaborately shaped parts on them that makes the engine interesting to look at and beautiful, but also makes cleaning the heads pretty labor-intensive. I have several cleaning tools to get into all the curves and surfaces to take the carbon chunks off and polish it all up. 3M pads, which are scratchy like a dish scrubber, come in soft, medium and hard pads that attach to a die grinder at the shop. I use the hard ones for the combustion chamber parts and the soft ones to polish the tops of the head. Flapper wheels are pieces of sandpaper glued together in a wheel shape, which also attaches to a die grinder. 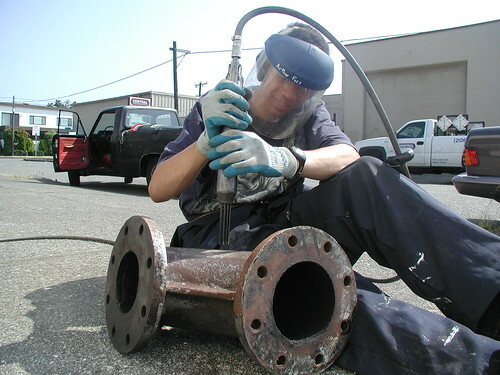 I use different-sized flapper wheels to clean up the cylindrical parts, like the valve cage holes and the water passages. Wire cup brushes, which are a wire brush shaped like a cup, are good to get into little curved places that are hard to reach. 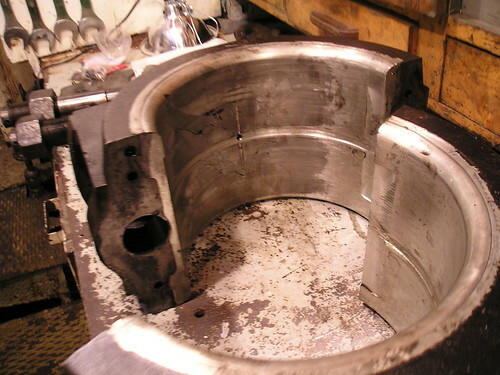 This happens because the bearings are recessed to allow oil to continually flow around the crankshaft and up the rods. Since we’ve re-babbitted so many of the bearings, all of these ridges need to be filed off to make the journals fit smoothly against the newly babbitted surfaces. I spent a lot of time filing off these ridges. I used a regular metal file to take the ridge off, then sand it, and polish it with an emery cloth to get all of the scratches out. I stopped and measured the journals for roundness a couple of times during the process and shaped them as close to round as I could. This is a very, very slow process, but it makes fitting the new bearings easier. Part of why it’s taking so long is because I’m a little inexperienced with this kind of work and I’m being really careful – too careful, if you ask Dan. He says that I’m “gilding the lily,” but agrees that the complexity of this process is worth the caution. I’ve also kept in contact with St. Louis Bearing about the work they’re doing for me, and am still waiting for Everett Engineering and Utah Babbitt to finish the rod bearings. When I apply for a loan, the bank gathers a lot of information about who I am and how I plan to pay back the loan. They have me fill out questionnaires and pull three separate credit reports. Since I plan to borrow and pay back banks for the rest of my life, I work hard to pay on time and be completely honest with the bank. This is a relationship that I value very much, since it helps me do business and make a living. There’s a similar credit report on the waterfront. It’s called gossip. Sometimes I see sloppy financial decisions and practices that affect people’s waterfront credit report. For example (hypothetically, of course), I might get asked to start another job before I’m paid for the last one, or get complaints about the quality or speed of a project that’s getting done at a reduced rate in between real jobs as a favor. Commonly, someone may be just slow to pay their bills, which doesn’t sound like a big deal until you realize that I’ve had to take out a loan to cover the expense of a job until I get paid for it. I’m often surprised that people who do this seem to think that no one else notices these sloppy practices. The waterfront gossip amazing: everyone knows everything about everyone else, and often about their family. I know lots of people on the waterfront who hold grudges from decades ago, people who still follow boycotts that originated in the sixties, and some people who won’t work with someone else because their father had a reputation as a jerk. Like any gossip, this kind of stuff goes around and stays around, and people love to add new stories that reinforce the old ones. This is not to say that all of these waterfront credit reports are negative, though. There are plenty good owners with good waterfront relationships that get a lot of attention. People follow success stories and want updates on their favorite boats that have gone to good new owners. I have a lot of people ask me “So how’s [name] doing?” because they’re genuinely interested in a project or a boat with a good reputation. Get in the game. Get to know other boaters and owners; ask for opinions and advice – even if it goes unused it can help guide you in other projects. This is a community that everyone should participate in. Pay on time. At least act like you know what you got yourself into, and minimize the whining (though we all know some is necessary). Educate yourself. Read and take classes so that when you do call on people for help, it’s help that you appreciate and can use. Take care of your boat. No one likes to help a lost cause or give someone advice that they’ll ignore. Your boat may be your most visible contribution to the community, so it should reflect your sincerity. This doesn’t mean that it has to be perfect and the brightwork all sanded every year – it means that you need to demonstrate that any work that goes into your boat is valued and maintained, whether you do it yourself or have someone else do it. Help others with their boats. This can be as simple as sharing any new tricks that you discover. Bonus points: call in with a report and some gossip on other boats, stop by the shop with some coffee, maybe take some classes or donate money to local maritime museums and heritage groups. These all get you involved in the community and show that you care about other boaters and other projects. You’ll meet people, word will get around that you’re a neat person, and people will be happy to work with you. Above all, everyone needs to realize that even though our unique waterfront community is made up of individualistic and self-sufficient people, we all need to get to know and respect each other more. We at OTM Inc are very interested in creating 3-D computer models of old engines. If you’re a graphic artist with experience in Vector Works or similar rendering programs and are interested in a neat project, we want you!